The perpetual discussion about a remedy for the sting of jellyfish seems to have bobbled to the surface again recently with the publication of an article (see reference) discussing a remedy for the stings of the Portuguese Man o’ War, Physalia physalis. 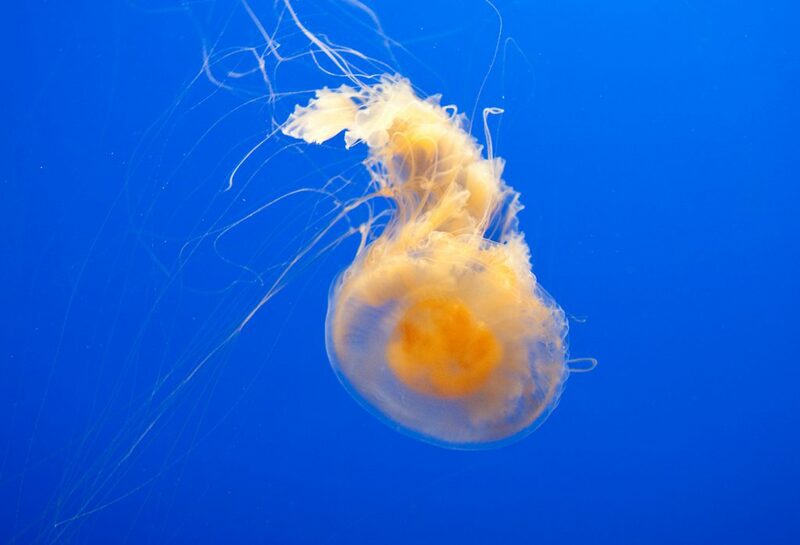 The authors tested many of the ostensible remedies for the pain of jellyfish stings held by that congress of all-knowing and all-encompassing marine information, the synopsis of the knowledge held by average scuba divers of the world. The study authors found that the best all-purpose remedy was vinegar, which trumped (urk!!) all other remedies. Short-circuiting my information below, I would claim the best all-purpose remedy is not be stung in first place, but I realize that that—besides the usual 30-40 point drop in IQ that comes immediately upon putting on a scuba face mask (which I have experienced many times, during my approximately 1,500 scuba dives), which causes a decided lack of rational behavior—there are situations when the jellyfish tentacles may not be visible, and envenomation will occur, in which case it is good to know a documented and useful remedy for the stings. That vinegar is a good remedy for many (most?) (all?) 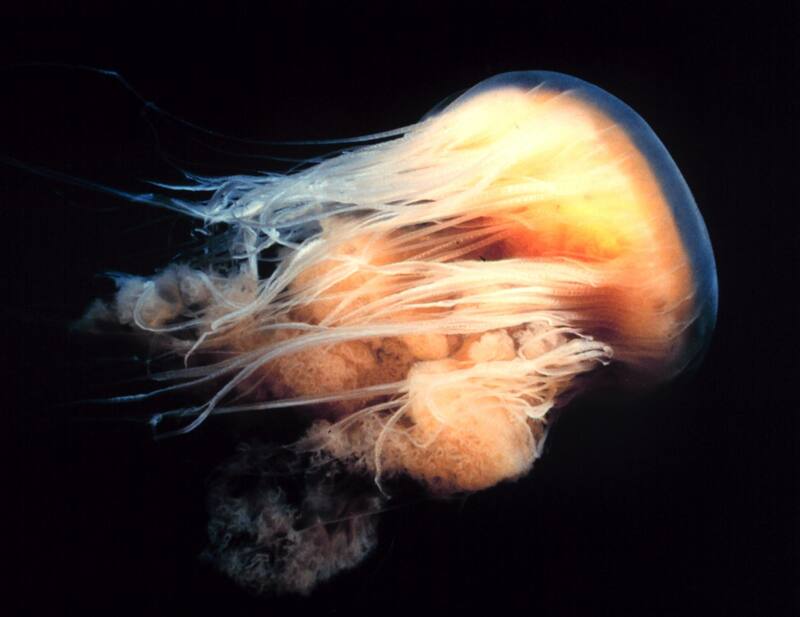 jellyfish stings has been known by many diving biologists for a very long time. “Olde mossie-backed divers” such as myself were usually told the urine tale in our scuba classes in the late 1960s or early 1970s; but once we started to think about it, particularly as scientists (junior grade), it made no sense whatsoever. Following that epiphany, the general remedy we arrived at in the early 1970s at the University of Washington Friday Harbor Labs (where there was a lot of diving going on at that time) was a one-two treatment of the area stung using vinegar and meat tenderizer. We figured the vinegar would cause the membranes around the nematocysts that hadn’t fired to rupture and die rapidly, stopping any further stinging, while the meat tenderizer (an enzyme that breaks down proteins) would help to start the disintegration of the nematocysts on the skin surface. I should mention that we did not have to deal with the Portuguese Man o’ War, as they were not found that far north; on the other hand, we did have to deal with some hellaciously large Cyanea capillata and Phacellophora camtschatica, both of which are notable for the nasty stings they produce. After the vinegar and meat-tenderizer treatment came a cold-water shower rinse (of short duration) before the usual after-dive warm fresh-water shower to get rid of any nematocysts and such remaining on your skin. Hot water will cause the nematocysts on the skin to discharge, so a cold water rinse will get many of them off without adding to one’s misery. There is not much one can do for the nematocysts in the skin that have fired, unfortunately, although some of us found that some anti-histamine pills worked well to sort of truncate our bodies’ later reactions. Another look (but don’t touch) at the Lion’s Mane Jellyfish, Chyanea capillata; this one estimated to be only 30 mm (1.18 inch) in diameter. Image by Dr. Ron Shimek. We generally carried meat tenderizer and plastic bottles of vinegar in our diving kits. Most of us doing research diving tended to have a small fishing tackle box that was used as a kit for emergencies of all sorts; it carried everything from neoprene cement to meat-tenderizer, to a small amount of rum or whatever, to apply either internally after a very cold winter dive or as a disinfectant on some cuts, before we put on some antibiotic or medicine before the cuts were bandaged. It sure came in handy in all cases. After a while, we figured the “urine remedy” was told to students because it was considered a “yucky” remedy, and that meant that people would watch out for the jellies a bit better, and as word got around, it would emphasize the “hero-diver” aspect of scuba diving. After all, if you had to pee on your wounds, you must really have hair on your chest and, I suppose, by inference, other things elsewhere. Phacellophora camtshatica, shown here at nearly 1 meter (3.28 feet) in length, is a sea jelly not to be messed with! Image by Dr. Ron Shimek. Kissed by an Anemone: Cnidarian Stings Part I, by Ronald L. Shimek, Ph.D. The urine treatment is an old and outdated remedy based on the observation that acidic fluids were an effective treatment and urine was always readily available. It wasn’t suggested because it was “yucky”. Given the rarity of being stung, most people didn’t routinely choose to carry vinegar. Being stung by jellyfish/men-o-war is hardly restricted to divers. I have been stung by man-o-war tentacles floating in the ocean after a violent storm while swimming off a beach on St, Croix (1968). Few people go the beach packing vinegar and a can of Adolf’s. Urine is not a great treatment but far better than nothing and it is readily available. I have a another question about your column. You went out of your way to express your disapproval of President Trump. What does your opinion of Donald Trump have to do with the treatment of jellyfish/man-o-war stings? Must we politicize everything? How does it help the free exchange of ideas? Shame on you. Let’s leave politics to the political arena and leave science to the scientific method. The urine treatment is an old and outdated remedy based on the observation that acidic fluids were an effective treatment and urine was always readily available. It wasn't suggested because it was "yucky". Given the rarity of being stung, most people didn't routinely choose to carry vinegar. Being stung by jellyfish/men-o-war is hardly restricted to divers. I have been stung by man-o-war tentacles floating in the ocean after a violent storm while swimming off a beach on St, Croix (1968). Few people go the beach packing vinegar and a can of Adolf's. Urine is not a great treatment but far better than nothing and it is readily available. I have a another question about your column. You went out of your way to express your disapproval of President Trump. What does your opinion of Donald Trump have to do with the treatment of jellyfish/man-o-war stings? Must we politicize everything? How does it help the free exchange of ideas? Shame on you. Let's leave politics to the political arena and leave science to the scientific method.